Aim: The aim of this study was to assess whether tumor necrosis factor alpha (TNF-α) levels are correlated with the behavioral syndrome of schizophrenia and/or metabolic abnormalities. Methods: Sixty patients with first-onset schizophrenia were recruited. The concentrations of TNF-α in the cerebrospinal fluid (CSF) were determined in 22 schizophrenia patients and ten patients with nonsuppurative appendicitis using a radioimmunoassay. Physiological characteristics such as fasting blood glucose, fasting insulin, triglycerides, corrected QT interval, waist circumference, and body mass index were measured prior to CSF collection. Subjects were screened for insulin resistance using the homeostasis model assessment. The extent of positive and negative behavioral symptoms was scored using the Positive and Negative Syndrome Scale. Results: The CSF TNF-α levels in schizophrenic patients were significantly lower than those in the control group. The age of disease onset was positively correlated with the CSF TNF-α level using Pearson correlation analysis (r=0.37, P<0.05). There were no significant differences in CSF TNF-α levels in terms of age, duration of schizophrenia, or systolic and diastolic blood pressure. Furthermore, the CSF TNF-α levels were not significantly correlated with fasting blood glucose, fasting insulin, insulin resistance index, triglycerides, corrected QT interval, waist circumference, or body mass index. No significant correlation was found between CSF TNF-α levels and the Positive and Negative Syndrome Scale total scores or other factors scores. There were also no significant differences in CSF TNF-α levels between patients with schizophrenia types I and II. Conclusion: CSF TNF-α levels are decreased in schizophrenia, although this reduction does not correlate with the psychopathology or coincident metabolic characteristics of this disease. More recently, TNF-α has been implicated in the pathogenesis of schizophrenia.14,15 However, this relationship remains controversial. To date, studies focused on TNF-α have mainly utilized two approaches: TNF-α gene expression analysis (such as the G308A polymorphism in the upstream promoter of the TNF-α gene) and measurement of TNF-α protein levels in body fluids. Nevertheless, associations between polymorphisms in the TNF-α gene and schizophrenia have not been clearly demonstrated.8,16,17 Many studies have measured the serum levels of TNF-α; however, the results from studies taking this approach have also not been consistent.18–20 Studies measuring the level of TNF-α in the CSF are relatively rare, and these levels are commonly below the threshold of detection. The following factors are known to influence patients with schizophrenia: age, gender, body mass index (BMI), smoking, the first episode/relapse, stress, diagnostic criteria, past or current infections, current drug use, and others.19,21,22 Indeed, some studies have taken factors such as the patient’s condition, and the drug dosage and classification into account.23–25 After analyzing a variety of cytokines, Potvin et al26 demonstrated the importance of inflammatory symptoms in patients with schizophrenia. Moreover, metabolic syndrome is frequently observed in patients with schizophrenia. Experts at the International Diabetes Federation have not only emphasized that central obesity and insulin resistance (IR) are important risk factors but also proposed that inflammatory indicators, such as TNF-α, may be related to metabolic syndrome and may predict the development of cardiovascular disease or diabetes. Indeed, evidence for the relationship between serum TNF-α levels and IR, central obesity, and high BMI has increased.27–31 In a variety of endocrine metabolic diseases, TNF-α can regulate insulin by influencing the insulin signaling pathway, which thus regulates obesity and IR. In a meta-analysis of schizophrenia and cytokine studies, Potvin et al26 also noted that weight gain should be given greater attention in the interpretation of the interaction between schizophrenia and TNF-α. However, no studies have evaluated the relationship between central obesity, IR, and TNF-α in schizophrenia. In this study, we sought to verify the relationship between schizophrenia and the immune system by measuring the concentrations of TNF-α in the CSF. In particular, we assessed the relationship between changes in TNF-α and the psychopathology of schizophrenia, as well as any coincident metabolic characteristics such as obesity and IR. The patients gave informed consent to participate in the study. The institutional review board of Guangzhou Psychiatric Hospital approved the study protocol, and this study was performed according to the hospital’s code of conduct. In accordance with the informed consent form, CSF was collected from 22 patients with schizophrenia. Control CSF was obtained from ten patients, including five males and five females, with nonsuppurative appendicitis who received lumbar spinal anesthesia before surgery. All venous blood samples were collected using the standard venipuncture technique. Venous blood (5 mL) was drawn between 6.30 and 7.30 am after the subjects had fasted for 12 hours. Then, the blood was centrifuged at 2,600× g for 7 minutes to isolate plasma. The serum was stored at −76°C. The CSF and serum TNF-α were assayed using a radioimmunoassay in accordance with the manufacturer’s instructions (the Department of Nuclear Medicine in the First Affiliated Hospital, Sun Yat-sen University, Guangzhou, People’s Republic of China). All the assays were performed. The intra- and inter-assay coefficients of variation for TNF-α were 5% and 8%, respectively. The lower limit of detection for TNF-α was 0.3 ng/mL, according to the information provided by the supplier. All measurements were performed in duplicate and expressed as ng/mL. Categorical data, such as gender, were analyzed using the chi-squared test and Fisher’s exact test, if necessary. Case–control differences in continuous variables were evaluated using two-tailed independent samples t-tests or one-way analysis of variance, followed by the least significant difference multiple range test for between-group comparison. Data are presented as the mean ± standard deviation (SD). A general linear model was used to consider case–control differences after adjusting for other factors and covariates on transformed data. Correlations were calculated with Spearman’s correlation matrix. P<0.05 was considered statistically significant. For the correlations between CSF TNF-α levels and fasting blood glucose, fasting insulin, and IR parameters, the zero-order partial correlation coefficient test was applied. Twenty-two patients with schizophrenia (males/females: 14/8, mean age 30.48 [SD 8.91] years) and 50 controls (males/females: 25/25, mean age 30.47 [SD 7.98] years) were included; 22 patients and ten controls (including five males and five females, mean age 29.96 [SD 8.84] years) donated CSF. The mean duration of the illness was 3.4 years (range, 0.25–6 years). The mean age and the proportion of gender were similar between the two groups (P>0.05). Figure 1 shows that the CSF TNF-α was lower in the patient group than in the control group (P<0.05). No significant difference in the serum level of TNF-α was observed between the patient group and the control group (P>0.05). 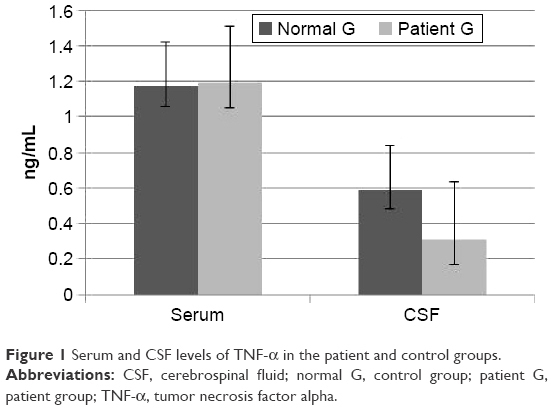 Figure 1 Serum and CSF levels of TNF-α in the patient and control groups. Abbreviations: CSF, cerebrospinal fluid; normal G, control group; patient G, patient group; TNF-α, tumor necrosis factor alpha. CSF TNF-α were 0.35±0.18 ng/mL (14 cases) and 0.30±0.25 ng/mL (eight cases), respectively, in the male and female patients. No significant difference was found between the patients and control groups in terms of gender (P>0.05). The onset age was positively correlated with CSF TNF-α levels by Pearson correlation analysis (r=0.37, P<0.05). There was no significant difference on CSF TNF-α levels in terms of age, duration, systolic, and diastolic blood pressure, which was analyzed by Pearson correlation analysis in schizophrenia patients group (P>0.05). With the Pearson correlation analysis, the results also indicated that the CSF TNF-α levels had no correlations with fasting blood glucose, FINS, IR index, triglycerides, corrected QT interval, waist circumference, and BMI (P>0.05). No significant correlation was found between CSF TNF-α levels and the PANSS total scores, P scores, N scores, or G scores (P>0.05). The schizophrenia type I (n=9) and II (n=13) groups showed PANSS total scores of 77.29±9.90 and 80.32±15.58, respectively, which indicated that the overall levels of disease severity were similar for the subgroups, and the data were comparable. The schizophrenia type I and II groups showed CSF TNF-α levels of 0.32±0.04 ng/mL and 0.30±0.05 ng/mL. There was no significant difference in CSF TNF-α levels between patients with schizophrenia type I and II (P>0.05). In neurological diseases, the cross talk of immune activation in peripheral blood versus CSF is of special interest as results may explain the involvement of the peripheral immune system to induce or control neuroinflammation. Even biomarker pattern analysis has led to a breakthrough in disease diagnosis and treatment.34 As reported earlier, we did not observe any difference in the serum levels of TNF-α between schizophrenic patients and healthy controls, but TNF-α levels were significantly lower in the CSF of patients with schizophrenia compared to healthy individuals. This finding in the serum is consistent with several earlier reports.4,21,23,24,26 It is not consistent with the other studies, such as Erbağci et al,22 Theodoropoulou et al,25 Upthegrove et al,35 Haack et al,36 and Naudin et al.37 They have found increased TNF-α in the serum of schizophrenic patients compared to normal control subjects. In the CSF, Paterson et al20 found that CSF TNF-α levels were higher in patients with schizophrenia compared to healthy controls. Even Maxeiner et al34 pointed out that affective and schizophrenic disorders clearly present with an inflammatory phenotype in the CSF and also in serum, the cytokines determined were, in general, higher in schizophrenia. Thus, our study suggests a reduction in the TNF-α level in the central nervous system of patients with schizophrenia. The concentrations of TNF-α indicating monocyte inflammation differed from the other findings. At this point, several other investigations should be considered. Sharief and Hentges38 report that TNF-α is important to the disease process in schizophrenia. In particular, these authors showed that TNF-α helps to restore the blood–brain barrier. Low levels of CSF TNF-α result from the inability of the cytokine to enter the central nervous system from the circulation, leaving only protein that is generated intrathecally. In general, the level of TNF-α is proportional to the abundance of functional CD4+ T-helper 1 (Th1) cells, and studies have shown a depletion of Th1 cells in schizophrenia with coincident enrichment in Th2 cells.39,40 Similar to Th1 cells, Th2 cells can also secrete TNF-α.41,42 Zhang et al43 suggested dysregulation in the cytokine system with schizophrenia and found that positive symptoms of schizophrenia may be linked to abnormally high levels of free radicals perhaps generated from dopamine (DA) metabolism and excessive DA release through an immune disturbance in cytokines, it remains unknown whether cytokines other than TNF-α also promote the pathological symptoms characteristic of schizophrenia and related psychiatric disorders. Moreover, it is not clear how unchanged TNF-α levels in the CSF is contributing to the schizophrenic phenotype. Müller et al,8 Potvin et al,26 and Kim et al44 mentioned that an imbalance of Th1 and Th2 cells was a critical factor related to the onset of the disease. Indeed, we infer that immune activation appears to be more restricted to CSF; insufficient TNF-α activity may explain the relatively weak cell-mediated immune response observed during the first episode and untreated schizophrenia, and support the hypothesis that mild inflammation is a unique characteristic of a subgroup of psychiatric diseases. In addition to the age of disease onset, we did not observe correlations between the CSF TNF-α concentration and variables, such as gender, duration of schizophrenia, corrected QT interval, or PANSS score. Moreover, we did not observe a correlation between TNF-α and various metabolic parameters in patients with schizophrenia. It seemed to indicate a change of CSF TNF-α in the early stage of disease occurrence. But the age range of both the patients and the control group should be widened, also the number of participants should be increased dramatically to obtain a full picture of the ratios involved and produce clearer results and indicators. We must caution, however, that TNF-α may be important to neural and immune processes even if it is not related to the severity of psychosis and is not a good indicator of disease severity. While TNF-α may contribute to the early stages of brain degeneration or to the onset of abnormal neuroimmunologic reactivity, its relative abundance may not be directly related to the outward manifestations of schizophrenia.24,26,40 Some studies have proposed that TNF-α might participate in the pathophysiological processes of both central obesity and the occurrence of IR, which are closely related to metabolic diseases such as diabetes and cardiovascular disease. Grigsby and Dobrowsky45 proposed that TNF-α might interfere with insulin information transfer upstream of the insulin receptor, at the receptor, or downstream of the insulin receptor. In addition, Wärnberg et al28 suggested that obesity is related to TNF-α and other inflammatory factors in healthy Japanese adolescents. Park et al29 and Moon et al30 showed that the serum TNF-α level was significantly related to weight, waistline circumference, and BMI; therefore, interventions to reduce obesity may prevent increased levels of this cytokine. In 2008, Bo et al31 proposed that visfatin may increase the waist circumference and that TNF-α and inflammatory cytokines are involved in this process. However, our data showed no significant and direct correlations between CSF TNF-α and various metabolic abnormalities in patients with schizophrenia. Current study showed that CSF TNF-α levels are decreased in schizophrenia, although this reduction does not correlate with the psychopathology or coincident metabolic characteristics of this disease. It would be useful to examine the postmortem brain literature for this protein/gene. There have been several known weaknesses in this study, due to the participation of only 22 enrolled schizophrenic samples and particularly small number of CSF subjects (n=10) in the control group. Another primary factor was cultural and laboratory resources that were unavailable to us during this study. Moreover, the levels of other proinflammatory cytokines such as interleukin 1 (IL 1) and interleukin 6 (IL 6) were not determined, and the association between serum TNF-α levels and physiological characteristics should also be examined. This work was supported by Grant 2006-YB-114 and 2007A23 from the Medical and Health Science and Technologies in Guangzhou Fund Project, and by Grant 2007213 from the Guangdong Province Traditional Chinese Medicines Agencies Building Strong Scientific Research Projects. We thank Miss Xiao Lin, who kindly assisted with the preparation and proofreading of the manuscript. No conflict of interest exists in the submission of this manuscript. The author does not have shares in any pharmaceutical company, nor do family members. The author does not accept any personal retainer from any pharmaceutical company. Cai S, Lu H, Bai Z, Wu R, Zhao J. Paliperidone extended-release tablets in Chinese patients with schizophrenia: meta-analysis of randomized controlled trials. Neuropsychiatr Dis Treat. 2015;11:1817–1834. Tanaka S, Matsunaga H, Kimura M. Autoantibodies against four kinds of neurotransmitter receptors in psychiatric disorders. J Neuroimmunol. 2003;141(1–2):155–164. Eaton WW, Byrne M, Ewald H. Association of schizophrenia and autoimmune diseases: linkage of Danish national registers. Am J Psychiatry. 2006;163(3):521–528. Brown AS. The risk for schizophrenia from childhood and adult infections. Am J Psychiatry. 2008;165(1):7–10. Koponen H, Rantakallio P, Veijola J, Jones P, Jokelainen J, Isohanni M. Childhood central nervous system infections and risk for schizophrenia. Clin Neurosci. 2004;254(1):9–13. Bechter K, Reiber H, Herzog S, Fuchs D, Tumani H, Maxeiner HG. Cerebrospinal fluid analysis in affective and schizophrenic spectrum disorders: identification of subgroups with immune responses and blood-CSF barrier dysfunction. J Psychiatr Res. 2010;44(5):321–330. Carswell EA, Old LJ, Kassel RL, Green S, Fiore N, Williamson B. An endotoxin-induced serum factor that causes necrosis of tumors. Proc Natl Acad Sci U S A. 1975;72(9):3666–3670. Müller N, Riedel M, Ackenheil M, Schwarz MJ. The role of immune function in schizophrenia: an overview. Eur Arch Psychiatry Clin Neurosci. 1999;249:462–468. Boin F, Zanardini R, Pioli R, Altamura CA, Maes M, Gennarelli M. Association between -G308A tumor necrosis factor alpha gene polymorphism and schizophrenia. Mol Psychiatry. 2001;6(1):79–82. Trapali M, Liapi C, Perelas, et al. Affect of isocaloric diets and sibutramine on food intake, body mass variation and serum TNF-alpha levels in rats. Pharmacology. 2008;82(1):15–21. Richards LJ, Chover, Gonzalez A, Harbuz MS, Jessop DS. Protective effects of endotoxin in a rat model of chronic inflammation are accompanied by suppressed secretion of pro-inflammatory cytokines and biphasic alteration in hypothalamo- pituitary-adrenal axis activity. J Neuroendocrinol. 2006;18(11):875–882. Kariagina A, Romanenko D, Ren SG, Chesnokova V. Hypothalamic-pituitary cytokine network. Endocrinology. 2004;145(1):104–112. Ko WC, Liu TP, Cheng JT, Tzeng TF, Liu IM. Effect of opioid mu-receptors activation on insulin signals damaged by tumor necrosis factor alpha in myoblast C2C12 cells. Neurosci Lett. 2006;397(3):274–278. Figiel I. Pro-inflammatory cytokine TNF-alpha as a neuroprotective agent in the brain. Acta Neurobiol Exp (Wars). 2008;68(4):526–534. Watanabe Y, Muratake T, Kaneko N, Fukui N, Nara Y, Someya T. No association between the tumor necrosis factor-alpha gene promoter polymorphisms and schizophrenia in a Japanese population. Psychiatry Res. 2007;153(1):1–6. Czerski PM, Rybakowski F, Kapelski P, et al. Association of tumor necrosis factor -308G/A promoter polymorphism with schizophrenia and bipolar affective disorder in a Polish population. Neuropsychobiology. 2008;57(1–2):88–94. Pae CU. Potential role of lymphotoxin-alpha (tumor necrosis factor-beta) in the development of schizophrenia. Med Hypotheses. 2007;68(6):1359–1362. Liu L, Jia FJ, Li HF. The mRNA expression levels of IL-1beta, TNF-alpha and tyrosine hydroxylase in peripheral blood of paranoid schizophrenic patients. Xi Bao Yu Fen Zi Mian Yi Xue Za Zhi. 2007;23(11):1043–1045. Mittleman BB, Castellanos FX, Jacobsen LK, Rapoport JL, Swedo SE, Shearer GM. Cerebrospinal fluid cytokines in pediatric neuropsychiatric disease. J Immunol. 1997;159(6):2994–2999. Paterson GJ, Ohashi Y, Reynolds GP, Pratt JA, Morris BJ. Selective increases in the cytokine, TNFalpha, in the prefrontal cortex of PCP-treated rats and human schizophrenic subjects: influence of antipsychotic drugs. J Psychopharmacol. 2006;20(5):636–642. Barak V, Barak Y, Levine J, Nisman B, Roisman I. Changes in interleukin-1 beta and soluble interleukin-2 receptor levels in CSF and serum of schizophrenic patients. J Basic Clin Physiol Pharmacol. 1995;6(1):61–69. Erbağci AB, Herken H, Köylüoglu O, Yilmaz N, Tarakçioglu M. Serum IL-1beta, sIL-2R, IL-6, IL-8 and TNF-alpha in schizophrenic patients, relation with symptomatology and responsiveness to risperidone treatment. Mediators Inflamm. 2001;10(3):109–115. Coelho FM, Reis HJ, Nicolato R, et al. Increased serum levels of inflammatory markers in chronic institutionalized patients with schizophrenia. Neuroimmunomodulation. 2008;15(2):140–144. Saetre P, Emilsson L, Axelsson E, Kreuger J, Lindholm E, Jazin E. Inflammation-related genes up-regulated in schizophrenia brains. BMC Psychiatry. 2007;7:46. Theodoropoulou S, Spanakos G, Baxevanis CN, et al. Cytokine serum levels, autologous mixed lymphocyte reaction and surface marker analysis in never medicated and chronically medicated schizophrenic patients. Schizophr Res. 2001;47(1):13–25. Potvin S, Stip E, Sepehry AA, Gendron A, Bah R, Kouassi E. Inflammatory cytokine alterations in schizophrenia: a systematic quantitative review. Biol Psychiatry. 2008;63(8):801–808. Zinman B, Hanley AJ, Harris SB, Kwan J, Fantus IG. Circulating tumor necrosis factor-alpha concentrations in a native Canadian population with high rates of type 2 diabetes mellitus. J Clin Endocrinol Metab. 1999;84(1):72–78. Wärnberg J, Nova E, Moreno LA, et al. AVENA Study Group. Inflammatory proteins are related to total and abdominal adiposity in a healthy adolescent population: the AVENA Study. Am J Clin Nutr. 2006;84(3):505–512. Park HS, Park JY, Yu R. Relationship of obesity and visceral adiposity with serum concentrations of CRP, TNF-alpha and IL-6. Diabetes Res Clin Pract. 2005;69(1):29–35. Moon YS, Kim DH, Song DK. Serum tumor necrosis factor-alpha levels and components of the metabolic syndrome in obese adolescents. Metabolism. 2004;53(7):863–867. Bo S, Ciccone G, Baldi I, et al. Plasma visfatin concentrations after a lifestyle intervention were directly associated with inflammatory markers. Nutr Metab Cardiovasc Dis. 2009;19(6):423–430. Crow TJ. Molecular pathology of schizophrenia: more than one disease process? Br Med J. 1980;280(6207):66–68. Maxeiner HG, Marion Schneider E, Kurfiss ST, Brettschneider J, Tumani H, Bechter K. Cerebrospinal fluid and serum cytokine profiling to detect immune control of infectious and inflammatory neurological and psychiatric diseases. Cytokine. 2014;69(1):62–67. Upthegrove R, Manzanares-Teson N, Barnes NM. Cytokine function in medication-naive first episode psychosis: a systematic review and meta-analysis. Schizophr Res. 2014;155(1–3):101–108. Haack M, Hinze-Selch D, Fenzel T, et al. Plasma levels of cytokines and soluble cytokine receptors in psychiatric patients upon hospital admission: effects of confounding factors and diagnosis. J Psychiatr Res. 1999;33(5):407–418. Naudin J, Capo C, Giusano B, Mège JL, Azorin JM. A differential role for interleukin-6 and tumor necrosis factor-alpha in schizophrenia? Schizophr Res. 1997;29(2–3):227–233. Sharief MK, Hentges ER. Association between tumor necrosis factor-a and disease progression in patients with multiple sclerosis. N Engl J Med. 1991;325(7):467–472. O’Brien SM, Scully P, Dinan TG. Increased tumor necrosis factor-alpha concentrations with interleukin-4 concentrations in exacerbations of schizophrenia. Psychiatry Res. 2008;160(3):256–262. Yu B, Becnel J, Zerfaoui M, Rohatgi R. Serotonin 5-hydroxytryptamine(2A) receptor activation suppresses tumor necrosis factor-alpha-induced inflammation with extraordinary potency. J Pharmacol Exp Ther. 2008;327(2):16–23. Katsikis PD, Cohen SB, Londei M, Feldmann M. Are CD4+ Th1 cells pro-inflammatory or anti-inflammatory? The ratio of IL-10 to IFN-gamma or IL-2 determines their function. Int Immunol. 1995;7(8): 1287–1294. Romagnani S. Th1/Th2 cells. Inflamm Bowel Dis. 1999;5(4):285–294. Zhang XY, Zhou DF, Qi LY, et al. Superoxide dismutase and cytokines in chronic patients with schizophrenia: association with psychopathology and response to antipsychotics. Psychopharmacology (Berl). 2009;204(1):177–184. Kim YK, Myint AM, Lee BH, et al. Th1, Th2 and Th3 cytokine alteration in schizophrenia. See comment in PubMed Commons below. Prog Neuropsychopharmacol Biol Psychiatry. 2004;28(7):1129–1134. Grigsby RJ, Dobrowsky RT. Inhibition of ceramide production reverses TNF-induced insulin resistance. Biochem Biophys Res Commun. 2001;287(5):1121–1124.